​High definition projectors generally display data, video, photos, and games in business or residential home-theater settings (Source). A projector is usually used in conjunction with a projector screen, though some buyers project on to their walls. The Epson, Optoma and BenQ projectors are all 1080p, meaning that they are considered Full HD. This means they provide 1,920 x 1,080p pixel resolution, and the 'p' refers to progressive, as opposed to interlacing ('i') scanning. Interlacing scanning displays odd and even lines, whereas progressive scanning means that the entire image is seen at once (Source). The Sony 4k projector was the only 'true' 4k home projector we examined. The Full HD Epson promotes its '4k enhancement', which means that it accepts a 4k signal, but it's down-scaled to its 1080p native resolution. The lowest-resolution, budget option is the traditional HD ViewSonic projector. HD: 720p image resolution. It's 1,280 x 720 pixels: about 1 million total pixels. Full HD: 1080p image resolution. It's 1,920 x 1,080 pixels: about 2 million total pixels. Ultra HD: 4K image resolution. It's 3,840 x 2,160 pixels: about 8 million total pixels (Source). The term 4K refers to Ultra High Definition (UHD) resolution of an electronic display (TV, laptop, computer, etc.) (Source). A 4K display generally means that it has 2,160 pixels running vertically and 3,840 pixels along its horizontal line of display (Source). 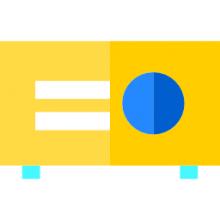 This near 4,000 horizontal pixel means that it provides 4x sharper resolution than 1080p, which is generally considered Full HD, as opposed to Ultra HD (Source). The Sony is markedly more expensive than the other non-4k options. In general, the extra resolution enhances clarity and definition to images, making them look more life-like- almost like you're 'looking through a window', buyers say (Source). Buyers have generally endorsed the Optoma- they say it is a low-priced option that has exceeded their high expectations. Specifically, reviewers tell us that it produces rich blacks and clean whites with pre-tuned adjustments that out-of-the-box displayed colors beautifully. Cable TV is gorgeous, buyers say, plus connecting it an XBox produced rave results. Set up wasn't difficult- though you can always pay someone to do it. In all, reviewers agree that it's a value option that provides superior performance. This Full HD home theater projector offered by Epson is well-made, bright and an excellent choice for anyone that wants a theater-like experience. Users love the rich, bright colors, but some do note that it’s expensive. The Epson home cinema projector measures 20.5” x 17.7” x 7.6”, and it features 4K enhancement technology, 2,500 lumens of color brightness, 2.500 lumens of white brightens, a 1,000,000:1 dynamic contrast ratio, an expansive color specter, and 16-piece glass lens. Another great thing about this Full HD projector is that it supports HDCP 2.2, and it’s HDR compatible so that you can watch Ultra HD Blu-ray content. The package also includes a remote control and a CD-ROM with user guide link. A reviewer shares that the quality of the picture is outstandingly clear and that the colors are very bright and deep. He says that it works very quietly and that it won’t bother you during the film. The buyer also notes that you can use it even during the day without any issues. Another user comments that the projector is easy to set up and that the contrast is amazing. He highly recommends it as the best home theater projects. A purchaser adds that he streams 4k videos regularly and that he doesn’t have any complaints. However, some customers have said that the quality of the picture is not as bright and clear as they expected. A user also notes that the HDR doesn’t work with Xbox One and Nvidia Shield TV. If you are looking for a top-notched home cinema projector, you might consider this Full HD projector offered by Optoma. Users love the brightness and the clarity of the picture, but some do note that the sound is not great. The Optoma cinema projector measures 11.73” x 9” x 3.7”, and it features 3000 ANSI lumens, 23,000:1 contrast ratio, an extended lamp life, an integrated 10-w speaker for outstanding sound quality, 1920 x 1080 full HD resolution, and REC.709 color space. Another great thing about his projector is that you can connect it to a smartphone or tablet using MLH, and you can watch 3D content with no issues. In general, users have a high opinion regarding the Optoma home cinema projector, and they praise the clarity and brightness of the picture. A buyer commented that he was skeptical of the quality of the home theater projector, but he was very surprised when he played his first movie. He says that the colors are magnificent and that the projector is user-friendly and easy to set up. Another reviewer shares that he has been using the Optoma projector for a few months and that the picture is still as crisp as it was in the beginning. A purchaser adds that this is one of the quietest projectors that he has owned and that you can watch a movie during the day and the picture will still be vibrantly clear. However, some customers have said that you can see rainbows in high contrast scenes and that the fan is noisy. Some users also state that they received a defective product. This 4K home theater projector for movies and games offered by Sony is bright, high-quality, and it’s recommended for screens up to 150 inches. Users love that they can view 2D content in 3D, but some do note that it’s overpriced. The Sony Ultra HD 4K home cinema projector measures 22.87” x 25.12” x 12.56”, and it features a 4096 x 2160 resolution, a 1,500 ANSI lm brightness, an integrated RF 3D sync transmitter, a quiet fan, and a weight of 30.9 pounds. Another great thing about this projector is that you can watch your 1080p HD movie in 4K thanks to Sony’s reality creation algorithm. A user comments that he set Sony 4K projector with a 125-inch screen and that the quality of the picture is better than he anticipated. He adds that the high resolution allows you to see every small detail and that he highly recommends it. Another reviewer shares that this is the best 4K home cinema projector that he has ever owned and that it’s sharp and bright. He says that the projector is better than UHDTV and that you get amazing features for a reasonable price. But the reviewer notes that the projector doesn’t have an automatic or manual iris. If you are searching for an affordable projector for home movies, you might consider this HDMI projector offered by ViewSonic. Users love that it’s compatible with Window and Mac and that they can connect it DVD or Blu-ray player, but some do note that the audio isn’t very loud. 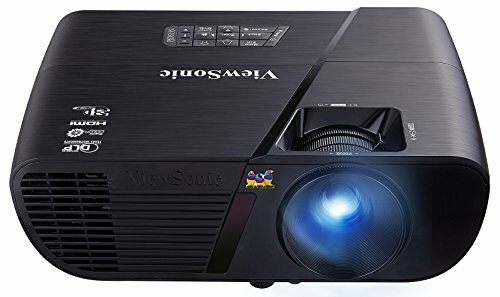 The ViewSonic home movie projector measures 12.44” x 8.98” x 4.08”, and it features a dynamic contrast ration of 20,000:1, an 800 x 600 resolution, 3300 lumens, an advanced color technology, and extended lamp life up to 10,000 hours. Another great thing about this projector is that you can watch 3D images, and it also has built-in speakers plus five unique view settings. In general, users have a high opinion regarding this HDMI home projector, and they agree that it’s one of the best cheap home cinema projectors available. A reviewer comments that the picture is sharp and clear and that the home projector is ideal for summer movie nights. He adds that it’s easy to connect the device to an AppleTV or a laptop and that it’s very light so you can move it wherever you want. Another user also says that the controls are very user-friendly and that the audio is loud. She highly recommends it to anyone looking for a cheap home movie projector. However, some customers have said that the home projector didn’t last very long and that lines started to appear on the picture. Some users also note that they find it hard to adjust the image. This video projector offered by BenQ is well-made, light, and an excellent choice for any gamer that prefers to play on the big screen. Users love that the projector comes with a carrying bag, but some do note that it’s made in China. The BenQ home gaming projector measures 14.98 x 4.79 x 10.91 in, and it features a full HD 1080 resolution, 2200 ANSI lumens, a contrast ratio of 15000:1, two built-in 10-watt speakers with, a 6x RGBRGB color wheel for brilliant colors. Another great thing about this gaming HD projector is that it has a specialized low input lag which is a crucial feature for any gamer who wants a superior gaming experience. 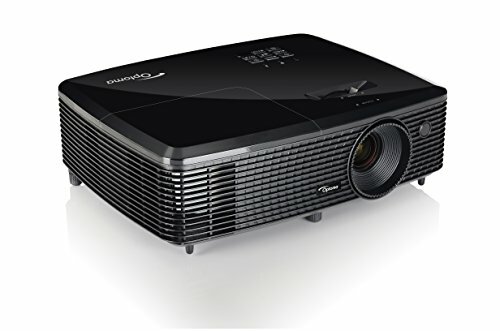 A buyer comments that the quality of the picture is truly remarkable and that you can connect the BenQ video projector to Netflix without any issues. He says that the projector provides an incredible gaming experience and that there is almost no input lag. Another reviewer observes that he has been using the home gaming projector from almost a year and that he hasn’t had any problems with its performance, picture or audio quality. A user adds that the image doesn’t need much calibration and that the fan works quietly. However, some customers have said that the lamp overheats and that there are black lines on the screen. Some also note that the gaming projector started to malfunction without a couple of months. The first wireless Full High Definition projector we examined is manufactured by Epson. This HDR (high dynamic range) -compatible digital projector is marketed as a color-rich option with exceptionally awesome black levels and a million to one dynamic contrast ratio. As well, it can provide a three-dimensional picture in addition to a high definition streaming, wireless signal. Buyers say that it accepts a 4K signal and that the 3-D capability functions at 1080p resolution. Reviewers advise that the high definition image quality varies based on its source. Another satisfied buyer told us he was impressed by the on and off shuttering, the amazing image clarity, the build of the center-mounted lens, its ability to radiantly display high-quality video even in daylight conditions, its exceptional video gaming capability, and the rich contrast that produces dark blacks. The second Full HD portable projector we examined is manufactured by Optima- this high-resolution home theater projector provides a 23,000 to 1 contrast ratio, though it doesn't have a lens shift. Interestingly, it comes equipped with an integrated 10 W speaker which means that you don't need external speakers in your home theater. Plus you can take it on the road and it functions as a (relatively) plug and play portable HD projector for mobile entertainment purposes. As well, it is a 3-D projector- it's marketed as capable of accepting content from any three-dimensional source, which includes game consoles, Blu-ray players, and different three-dimensional broadcasting content from Netflix, Amazon Prime, and Hulu. One buyer who is in the market for the best and cheapest high-def home theater projector told us that ultimately he was impressed by its quality- saying that the colors are vibrant, the blacks are rich, and the setup was not too difficult. Another homeowner did a ceiling mount installation and has remained impressed over the course of a year saying it has functioned well for playing video games and watching daytime television- also applauding the backlit remote. Another cord cutter told us he uses his 4K home a projector to stream from his computer via Chromecast and Roku and praises the robust lumens that enable quality daytime viewing, even when the window shades are drawn up on a sunny summer day. Another video gamer employs it with a range of different video gaming consoles including a PlayStation, Nintendo Wii, and Xbox, using the HDMI ports. 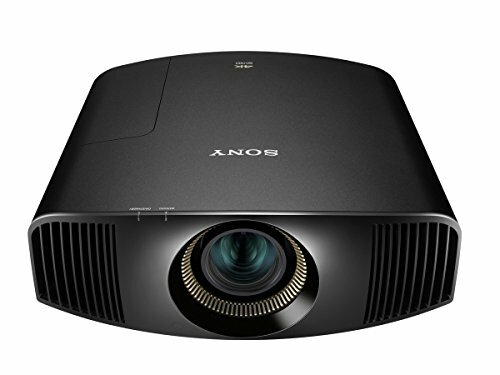 The third (true) 4K resolution projector we examined is provided by Sony. They recommended it for a 150-inch screen and marketed as comparable to professional-quality movie theater projector reels with its 4096 x 2160 pixel resolution. In addition, it features a 2-D to 3-D up-conversion algorithm, which turns two-dimensional video content into three-dimensional content. Reviewers were impressed, saying that it is a top 4K projector that produces phenomenal picture quality whether you are watching Blu-rays, streamed content from your desktop computer, or playing movies from Showtime and HBO. The 4th projector we examined was the ViewSonic option. This is a Windows and Mac-compatible projector that employees vertical digital keystoning, dynamic contrast ratios and adaptive flexible connectivity for home or business use. The integrated speaker provides robust audio- this helps make it into a portable high-resolution projector for on-the-go entertainment purposes. Many reviewers were flummoxed at all of the different options available, but one buyer we spoke with told us that this was a solid pick for them- endorsing the speakers as sufficiently loud, though when they take it outside for screening outdoor movies they need to hook it up to a speaker system. Another reviewer connected to his AppleTV and is able to remotely control it using his iPad and iPhone in addition to his Macintosh laptop. Another high-tech homeowner endorsed it as a value buy, praising its ability to scale out without suffering from distortion, its ability to work even in light conditions, and the robust adjustability of its lenses. On the downside, buyers have complained that the fan can be loud, that it heats up quickly, and that there are some coordination issues between the white and black balance. The last Full HD projector we examined was the BenQ high definition video gaming projector. It features 1080p resolution and is marketed as a highly responsive option engineered to facilitate video game play from PlayStation, Xbox, Nintendo consoles as well as PC desktops. One Halo and Overwatch e-gamer praises it for its lack of input lag- this means that the controller remains synchronized with the video game experience.